Aloe vera is a perennial plant, which is mostly cultivated worldwide for its medicinal and agricultural benefits. 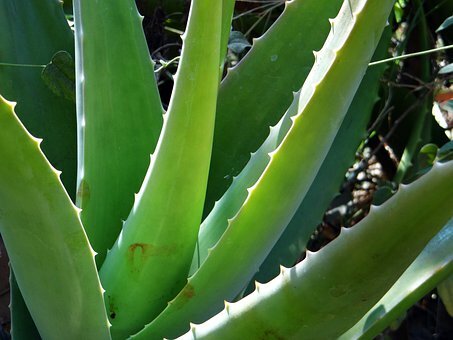 The aloe vera is extracted from the fleshy leaves of the plants. This plant has been widely studied for its therapeutic uses, a few of which are described below. Aloe gel consists of many phytochemicals with a probable antioxidant property like anthraquinone C-glycosides, other anthraquinones such as emodin, lectins, acetylated mannans, anthrones, etc.. Additional salicylic acid is also present in the gel, which has shown antibacterial properties. Aloe vera has been used since early times for topical application and treatment for burns, cuts, stings, rash and any other skin infection. The vitamin E present in the plant aids in decreasing the harmful effects of UV rays like sunburns, pimples, and blisters. In several cases, it has been noted that applying the gel even third-degree burns, helps in faster healing of the wounds and restores the skin faster. Moreover, the gel also helps in removing tan and stretch marks. The anti inflammatory property of Aloe vera helps in reducing many inflammatory conditions like arthritis and even reduces the joint and muscle pain. A topical application of the aloe vera reduces swelling and redness around the affected area and eases the pain. Some researchers also stated that Aloe vera comprised many compounds which arrested the growth of cancerous cells and protect against tumor formation. The polysaccharides present in the aloe plant consist of powerful macrophages that release tremendous amounts of nitric oxide, which has anti-cancer properties. Aloe gel also helps in soothing the burns and wounds that arise because of radiotherapy treatments. With advancing age, the skin loses its natural elasticity and becomes dry, which increases the incidence of wrinkles or fine lines. Aloe gel will help in removing the dead skin cells and moisturizes the skin. Some researchers have also stated that aloe gel improves the skin elasticity and delays the onset of aging. The pH of the scalp is acidic, i.e., 5.5. The commercial shampoos and hair products are alkaline in nature and can change the scalp pH. Any change in the scalp pH can cause hair-related issues, like baldness, dandruff, oily hair, etc.. Aloe vera removes the dead cells in the scalp, keeps scalp pH, reduces infections and soothes the scalp.